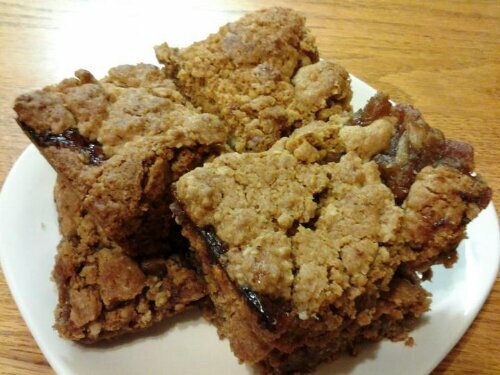 While growing up these Date Bars were a regular part of my mother’s baking. I treasured these squares. Oatmeal crispy mixture with puréed dates in between. Somehow over the years I fail to remember them, recalling them merely when I saw a recipe, driving through Dateland Arizona or seeing scrumptious dates. Oh my how delicious… for breakfast, lunch, brunch or tea (okay, ANYTIME). I had to start making these again! They are magnificent with the taste and consistency I remember; sweet yet earthy flavors. The chief element of these squares are the dates. Dates are the fruit of the palm tree that grow here in Arizona. They are sweet and are also an excellent source of protein, Vitamins A & B. Used for this recipe is medjool pitted dates. You can generally find them in the produce section of your grocery store. Before starting the date filling, you have to soften the dates in water, and then puree them in the food processor until nice and smooth, it can have some lumps. Then just make the oatmeal crust which, once more, is easily done in the food processor. Then layer the ingredients. First, 2/3 of the oatmeal mixture is pressed on the bottom of pan. Then the date puree is spread over the crust. Last, the rest of the oatmeal mixture is crumbled over the dates. Bake until golden brown. Mix and spread 2/3 of mixture in a 9×13 inch pan. Pat down. 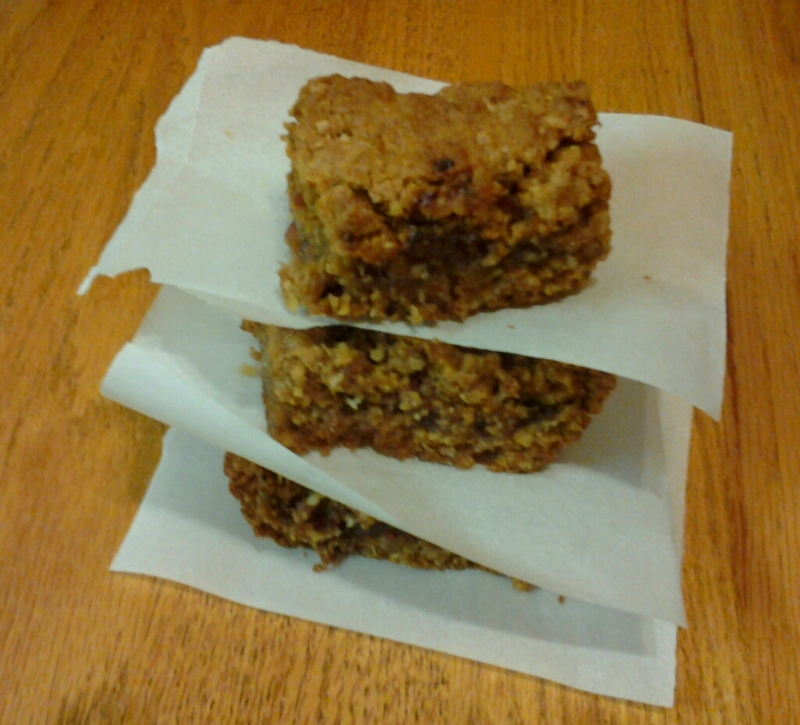 Spread over oatmeal mixture. Spread remaining oatmeal mixture over dates. Bake in moderate oven (350 degrees) for 45 minutes. Cut while warm.